Sewing with tone on tone fabrics is the perfect way to add visual depth to a quilt without the cluttered look of multicolored and 'busy' prints. The term tone on tone fabric, often shortened to either ToT or TOT, refers to printed fabrics that are designed by combining different shades and tones of the same color. The quilt shown on this page illustrates several types of ToT fabrics. Tone on tone fabrics often appear to be solid colors when viewed from a distance, but their printed motifs become visible when inspected more closely. Nearly all quilting fabric manufacturers offer tone on tone fabrics that work with both their own collections and with others. Tone-on-tone fabrics serve the same purpose as solid fabrics but do not appear as flat. Black fabric can add an intense depth to the quilt's appearance. 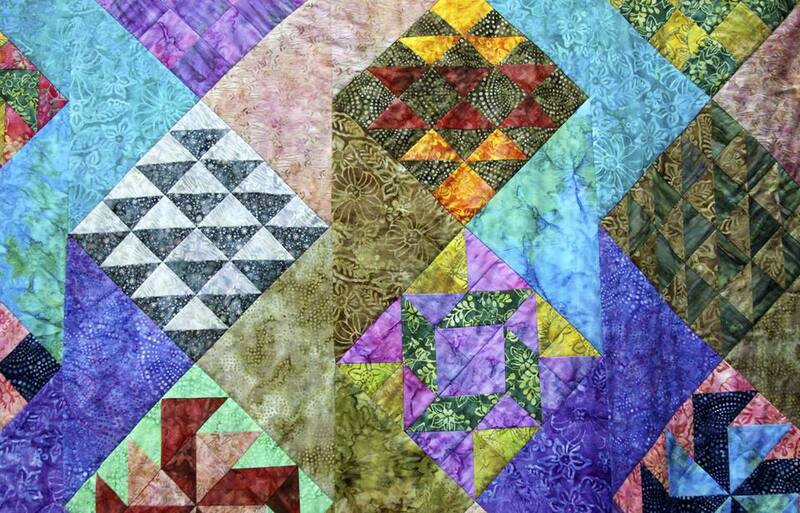 You'll find examples of black in many quilt patterns, such as the 16-patch quilt block pattern, the 25-patch quilt block pattern, and the easy Jigsaw quilt pattern. There are of course times when a solid color fabric is the best choice. Amish quilts are one example of quilts that were nearly always made with solid color fabrics. Stick with solids when recreating an Amish-look quilt. White on white fabrics are white versions of a tone on tone fabrics. These white fabrics are printed with white motifs. Occasionally, either the print or the fabric is slightly off-white and can even be closer to ivory. White on white fabrics often have a rubbery feel, especially when they are densely printed, and sometimes the printed areas shift in color over time, becoming either ivory or yellowed. Avoid using a hot iron in white on white fabrics to help keep the white areas from changing color. The Jewel Box quilt pattern is one type of quilt that looks gorgeous when brightly colored tone on tone fabrics are sewn against a rich black background. Try that technique with any quilt pattern. Some mottled fabrics and hand dyed fabrics are tone on tone fabrics. A mottled fabric doesn't truly have a design printed on its surface. Instead, these fabrics have a swirled appearance that's sometimes made up of light and dark versions of the same color. Batik fabrics can often be used in place of tone on tone fabrics. Many batiks are multicolor, but you'll find subtle versions created in multiple variations of one color. Choose quilting fabrics based on your own tastes but do try to work tone on tones into your quilts. You won't be sorry.